Determining whether a senior has a drinking problem can be challenging. Shaky hands, unsteady on their feet, or forgetfulness can be signs of normal aging, but these can also be signs of alcohol or substance abuse. If you suspect your parent has a drinking problem is it important to intervene before it becomes alcohol-induced dementia. According to the National Institute on Alcohol Abuse and Alcoholism (NIAAA), elderly adults are the fastest-growing group of problem drinkers. The reasons vary from depression, boredom during retirement, sadness from losing a spouse, to anxiety over finances, loss of social connections, or perhaps they have abused all their lives, and now it’s harder to continue to hide. Also, normal alcohol consumption for an adult male in his 40’s has a much different effect on a senior in his 70’s. An elderly drinker’s blood alcohol level (BAL) increases more quickly than a younger person’s BAL. A senior’s liver will metabolize alcohol more slowly, and their brains are more susceptible to the effects of an alcoholic drink. Drinking can have detrimental effects on a senior’s health. It can exacerbate some diseases among seniors, including diabetes, heart disease, and hypertension. Alcohol abuse can increase the risk of stroke and several types of cancer. And alcohol can reduce the effectiveness or interfere with their prescribed medications. Prescription drugs combined with alcohol can be deadly for any age but extremely serious for the elderly. But many don’t realize that excessive alcohol abuse can also cause alcohol-induced dementia. Alcohol-induced dementia is caused by prolonged and excessive alcohol consumption that causes neurological damage. As much as 20% of seniors diagnosed with dementia is caused by alcohol abuse. The good news is even though alcohol dementia is progressive, it can be reversed or halted if the alcoholic stops drinking (this should always be done under medical supervision). But they need to stop drinking entirely for their cognitive abilities to return partially or if they are lucky, entirely. But the bad news is there is also a point of no return for alcohol-induced dementia when the brain is too damaged and beyond repair. The most common form of alcohol-related dementia is a combination of two different conditions, Wernicke’s encephalopathy, and Korsakoff’s dementia. A person can develop one or the other condition, or both can occur together. These are caused by a deficiency of thiamine (vitamin B1). Alcohol prevents a person’s body from adequately absorbing this vital vitamin for brain function. Thiamine helps the brain produce energy from sugar. But if there is a deficiency in thiamine, brain cells do not produce enough energy to function. Wernicke’s encephalopathy causes imbalance, loss of coordination, confusion, abnormal eye movement, double vision, and eyelid drooping. Korsakoff’s dementia is a cluster of memory and cognitive difficulties and is longer lasting. It’s characterized by gaps in memory, making up lies or confabulation to fill in the gaps, inability to form new memories, hallucinations, and struggling to learn new information. Can a doctor test for alcohol-induced dementia? Because of their depletion of vitamin B, thiamine supplement can either be taken orally or by injection to restore this vitamin to the brain. This treatment has shown to improve diminishing brain function and, in some cases, fully return. According to the Alzheimer’s Association, approximately 75 percent of people suffering from alcohol-induced dementia do recover to some degree if the condition is found and treated promptly. This is hopeful news for caregivers who are dealing with elderly parents who are suffering from dementia connected to alcohol abuse. In situations, where their dementia has progressed too far for intervention, caregivers will need to do their best to make their mom or dad feel safe and comfortable. 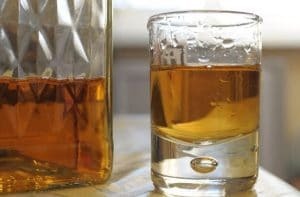 Because of the seriousness of this condition to their health, anyone who is an alcoholic and chooses to stop drinking should do so under the supervision of a healthcare professional. Hospitalization is generally recommended for detoxification of elderly adults. Following detoxification, your parent should receive treatment from an inpatient program, day treatment, outpatient therapy, or community-based program. Better results come from joining an elderly-specific treatment program who can cater to their unique circumstances. Studies have shown that elderly problem drinkers can benefit from treatment and more easily change their dementia symptoms than any other cause of dementia. How should I talk to my parent about their alcoholism? The National Council of Alcoholism and Drug Dependence offers helpful tips on their website on how to start a discussion about this sensitive topic while avoiding arguments or making them feel guilty. Try to avoid having this conversation while they have been drinking because this is not the right time for them to absorb information and it may frustrate you more. Choose your words carefully and let them know you are supportive and on their side. You don’t need to think in terms of an intervention, a series of mini-conversations where you focus on your observations of their behavior or health might be more readily accepted. As the caregiver of an alcoholic parent, it is important to practice self-care. Take a break when you need to. Get plenty of sleep, exercise, and eat healthy to keep up your strength. You don’t have to do this alone—talk with other family members for support or consult with a therapist or join a support group. Don’t forget that your health is just as important as your parent’s health and wellbeing. Our expert nurses can help answer more questions you have about caring for a senior with alcohol-induced dementia. Contact your local Aegis Living community and ask to speak to one of our nurses for advice and referrals.